2017 JAY SWANSON MEMORIAL 9-BALL "THE SWANEE"
Watch All the Action for Free! The 2017 Jay Swanson Memorial 9-Ball "The Swanee" was live-streamed for free on the CSI Facebook page and ​included top professional players such as Oscar Dominguez, Rodney Morris, Francisco Bustamante, Vilmos Foldes, and many more. All live-streamed matches will remain on the CSI Facebook page for anyone to view absolutely free. We hope you enjoy these matches and please feel free to share them on your Facebook timelines with all your friends! Below are just two of the matches from the event. Watch all videos on Facebook! Jay Swanson passed away in June 1996 and just a few months later in September, the first Jay Swanson Memorial was held. Over the years, the “Swanee” has experienced tremendous growth. The first year was a modest 64 players, the next three were limited to 96, and continued demand required us to increase the field to 192. 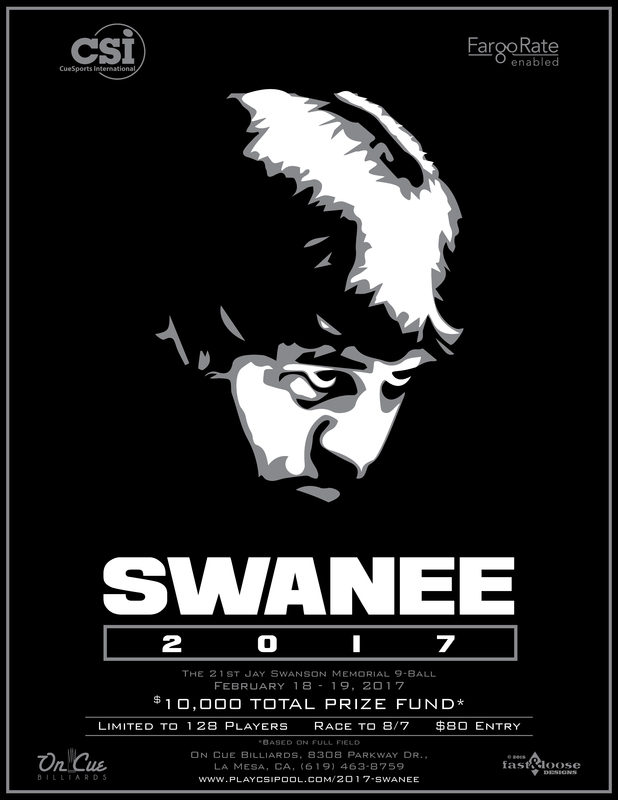 This year marks the 21st year of the “Swanee” and the event is undergoing some changes. Last year, the event was moved back to the San Diego area where it originated and it was a huge success. The "Swanee" is and was always meant to be - a social pool event to celebrate the life of Jay Swanson.